Celine Dion will launch Chic for Women this April. The new scent is "meant to convey sophistication and Celine’s evolvement into high-fashion looks". Chic was developed by perfumer Patricia Choux, and includes notes of aquatic greens, watermelon, peony, drenched gardenia, lotus flower, green violet, blond woods, sandalwood, amber and musk. 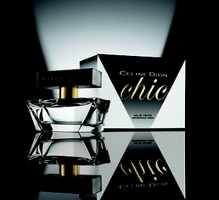 Celine Dion Chic will be available in 15, 30 and 50 ml Eau de Toilette and in matching body products. Also in April, Gap will introduce Close, a new fragrance for women. Close is not related to the Gap fragrance of the same name that debuted in 2000 and that has since been discontinued. The brand hopes that the new Close will attract "a more mature 20-plus customer". Close is described as a "salty floral citrus", and was developed by perfumer Marypierre Julien. The notes feature sparkling water accord, almond blossom, salty citrus accord, freesia, jasmine, daphne, stephanotis, sandalwood, skin musk, vanilla and amber. Gap Close will be available in 10, 50 and 100 ml, concentration unknown. (both above via wwd) Update: see a review of Gap Close. Hmmm, “evolvement” sounds a bit funny… if only there were already a word for the process of evolving. .
LOL, that's so funny! Hey, as a journalism grad, I feel your pain! I'm as big a grammar snob as anyone, but “evolvement” has been in use since the mid 1800s. It's in the OED. It's a word. You don't have to like it, but it really is an actual word. “Evolution” may be more common, but we have lots and lots of duplicated words in English. Thanks…I assumed it was a “made up” word too! Evolution certainly sounds better. Okay, it's a legit word so we all won't get our Warner's English Grammar texts in a bunch…it sounded a tad “made up” but, yeah it's in my garden variety American heritage dic. too (I checked) …..but it sounds STUPID which makes a bad IMPESSION and advertising is all about the impressions. Eek, how embarassing. Sorry! Ignore me and go back to discussing the actual fragrances. How old am I that I don't automatically associate “20 plus” and “mature” with each other?? Very old, it seems! I wish Gap would choose a new name, if this fragrance has nothing to do with the earlier one of the same name. That's kind of misleading, IMO. Thanks for that. I went into a snit this morning while reading a poetry review, when the critic used the (made up) word “persay”. I always appreciate someone (like yourself) who uses the language properly. LOL — well, I suppose it's older than the typical Gap customer, right? Close sounds very fresh, but I will try to give it a sniff too. Is that how she got her start? I didn't know! And yet she never got a nose job? Meooooooww. . . Yes, she sang in French as that's one of the official languages of Switzerland. In fact, she won! (It was 1988). by which time she has had something done to her teeth, I think. Wow, would not have recognized her in her pre-evolvement stage. Amazing. It's hard to tell what she did have done (and I don't know much about her at all). Isn't using the singer's name and the word “chic” in the same phrase an oxymoron? (Scratch, hiss) I would never, ever buy anything with her name on it even though the notes sound mostly up my alley. You'd probably hear the screaming of “my heart will go on” when you take off the lid. I really enjoyed the grammatical thread this morning. Perhaps evolvement applies to the changing of things other than living organisms. The name Close is kind of like JLo's Live. I never know how to say it. Is it like ''close the door” or “close to you”? Is it JLo singing “Live” or “live your life'? Could we have a poll of the most ridiculous fragrance names? LOL — I really know zip about CD, so if she has horrid taste in clothes I never knew it until I saw the videos linked to above. The most ridiculous fragrance names – I think that would make a great Lazy Friday poll! Oy – I have to admit my hair looked something like that. I look at old photos and wonder, what was I thinking?? I hear that nose surgery can affect the voice. I don't think she would have taken that kind of risk. Yep, I was a walking ad for “Big Bad Mall Hair”, and everyone wonders why there were no pics of me from H.S.!! I wondered if it was from “Close the gap”, so maybe the first? Their ad execs have a history of playing on the “gap” notion. . . Does sparking water smell like enough that it has to have an accord all its own? Although I do rather like the salty floral citrus idea. Yes, we all looked like that in the 80's, pretty much. Is getting your teeth fixed considered having “work done”? I wore braces, but didn't consider that under the category of plastic surgery. Me too! something like Fleurs de Sel, or the Hermes Jardin de Mediteranee I sampled today. I'm glad you posted – I was thinking I was the only one kind of interested in Close. OMG! In the Eurovision clip, is that horrid white jacket the same one she 'mistakenly' wore back to front??? This woman wouldn't know style if she tripped over it. As for the Gap denoting 20+ as mature, wow, at nearly 32 I must be ready for the nursing home in perfume years! I like the sound of Chic – trying with difficulty to forget my own 80's perm as I type – I guess I would lose the watermelon and the peony possibly, but everything else sounds like my kind of thing, even allowing for the discomfiting use of the word “drenched”. That annoys me in the same way that management consultants do when they talk about “cascading” information. Tama, well, it generally means it's got an aquatic accord of some kind. I always appreciate the warning. Yeah, I know, and I appreciate the warning, too, but it's still a little silly. I'm glad water doesn't actually smell as bad as perfume would have you think. No time for braces – there would only be a gap of a few weeks between the two events – therefore some kind of surgical intervention. In the UK, that counts as Serious Work! I don't think she's had her nose done, but I think a few other places (chin?) are not the same as they were. It seems a bit sad to me – her voice is good enough for it not to matter what she looks like.